Wikimedia Community User Group Malaysia (MYS) is a Wikimedia user group for people living in, interested in or connected to Malaysia and also its relations/connections to the neighboring countries and around the world. We support the goals of the Wikimedia Foundation, including the work of volunteers on Wikimedia projects as well as numerous other free knowledge initiatives. Our aim is to support, promote, and educate the general public about the availability and use of free and open educational content, which includes the ability to access, develop and contribute to Wikimedia projects. Our medium language is English (en) and/or Malay (ms), but we are also trying to expand the usage of Mandarin (zh), Cantonese (zh-yue) and Tamil (ta) languages, and probably one of the indigenous language of Malaysia. In the event of discrepancy of information between the other language versions of this page, the English version of this Malaysia user group shall prevail. The Wikimedia Community User Group Malaysia upholds strict zero discrimination, venue with disability access, friendly space, nonprofit activities, weekend-only events, low profile and open and transparent policies. The organization was founded on 22 May 2016 in Nusajaya, Johor with our very first meetup. On 10 September 2017, it was recognized as a user group under the name Wikimedia Community User Group Malaysia by Wikimedia Foundation. To achieve these objectives, the User Group will organize and arrange various meetups, presentations, training and drives both on and off-wiki. Our goal is to set a solid foundation for a Wikimedia in Malaysia and to run series of Wiki Projects and initiatives throughout Malaysia. Presentation from Malaysia during the ESEAP Conference 2018. 4 August - The establishment of WikiProject Malaysia. 27 April - The first Wiki Loves Monuments in Malaysia. 28 April - The creation of Wikimedia Community User Group Malaysia meta page. 8 November - Visit and engagement with Wikimedia Singapore community to learn on establishing the Wikipedia Malaysia community (Singapore Meetup 8). 16 May - The designing of Wikipedia Malaysia Meetup vertical retractable standing banner (credit to Tribeca Studio). 22 May - The first Wikipedia meetup in Malaysia (Johor Meetup 1), thus this shall be the birth date of Wikipedia Malaysia community. 5 June - The first Wikipedia meetup in the capital city (Kuala Lumpur Meetup 1). The first engagement with Wikipedia Education Program (Selangor Meetup 1). Creation of Wikipedia Malaysia editors WhatsApp group chat. Agreement on which page to use this Facebook Page unofficially for the user group publicly. 25 February - The first meetup with corporation (Selangor Meetup 2). 31 March - 2 April - Wikipedia Malaysia Community (1 editor) participated in Wikimedia Conference 2017 in Berlin, Germany. 22 April - Meeting to enact and agree to form the Wikimedia Malaysia User Group (Kuala Lumpur Meetup 2). 9 May - Submission for approval to make Wikipedia Edit-a-thon in conjunction and participation with local festival event. 17 May - Submission approved for the Wikipedia Edit-a-thon in conjunction with local festival event (Johor Bahru Writers + Film Festival 2017). 22 May - The first anniversary of Wikipedia Malaysia community. 30 May - Application submission to establish Wikimedia Malaysia User Group under the name Wikimedia Community User Group Malaysia. 10 August - The first overseas Malaysia meetup (Indonesia-Malaysia Meetup 1) which was with Wikimedia Indonesia Chapter to learn on running Wikimedia user groups and their related activities. 10 September - The recognition of Wikimedia Community User Group Malaysia. 25 September - The design of the user group logo - English version (credit to Wikimedia Philippines member Exec8). 8 October - The first meetup with school (Johor Meetup 2). 13 October - The approval of the user group logo by the Affiliations Committee of Wikimedia Foundation. 22 October - The first meetup/event in conjunction with city festival (Johor Meetup 3). 30 October - Initial discussion on creating standardized name cards for the user group organizing committees (in English and also Malay, Mandarin and Tamil). 1 November - The design of the user group logo - Malay version (credit to Exec8). 21 November - The approval to make the first Wikipedia Malaysia meetup at college (Johor Meetup 4). 6 December - The approval to make Wikipedia Johor Meetup 5. 9 December - The first meetup with college (Johor Meetup 4). 10 December - The creation of Wikimedia Community User Group Malaysia official Facebook group. 16 December - The approval to make the first Wikipedia Malaysia meetup at social charity institution (Johor Meetup 7). 17 December - The discussion to make the future first Wikipedia Malaysia meetup at high school. 20 January - The second meetup with college (Johor Meetup 5). 3 February - The design of the user group logo - Chinese version (credit to Exec8). 20 February - The agreement to make Wikipedia Johor Meetup 6. 24 February - The first follow up meetup (Johor Meetup 6) from the previous meetup (Johor Meetup 4). 26 February - Submission to make Wikimedia Community User Group Malaysia name cards. 5 March - Received the Wikimedia Community User Group Malaysia name cards. 8 March - The promotion of Wikipedia Writing Workshop at Crescendo International College Open Day 2018. 1 April - The detailed discussion on the venue and time to make the first Wikipedia Malaysia meetup at social charity institution (Johor Meetup 7). 6 April - Initial online discussion to make future Wikipedia meetup with an art institution (Johor Society for the Performing Arts) in Johor. 14 April - The first meetup with social institution (Johor Meetup 7). 15 April - The confirmation to make the first meetup in Kedah (Kedah Meetup 1). 16 April - Online discussion to make future Wikipedia meetup at a university (Northern University of Malaysia) in Kedah. 17 April - Online discussion to make future Wikipedia meetup with a think tank institution (Asian Institute of Finance) in Kuala Lumpur. 20-22 April - Wikimedia Community User Group Malaysia (1 editor) participated in Wikimedia Conference 2018 in Berlin, Germany. 25 April - Further face-to-face discussion to make future Wikipedia meetup with an art institution (Johor Society for the Performing Arts) in Johor. 28 April - The first Malaysia meetup with Wikimedia Taiwan Chapter (Malaysia-Taiwan Meetup 1) in Taipei, Taiwan. 5-6 May - Wikimedia Community User Group Malaysia (2 editors) participated in ESEAP Conference 2018 in Bali, Indonesia. 16 May - Online discussion with Asian Institute of Finance on Wikipedia article creation. 28 June - Online discussion to organize meetup with college students specifically to discuss the usage of Wikipedia in the study research of students of all subjects (Johor 8). 30 June - Wikimedia Community User Group Malaysia presentation entitled Wikipedia: From Encyclopedia to Free Knowledge Movement at GeekCampKL 2018 in Kuala Lumpur (Kuala Lumpur 3). 9 July - The creation of WhatsApp group with Crescendo International College people for Johor Meetup 8. 14 July - The first follow up Malaysia meetup from the previous meetup at the same venue (Johor Meetup 8). 15 July - The design of the user group logo - Tamil version (credit to Exec8). 6 August - The first Malaysia meetup in the state of Kelantan and with high school (Kelantan 1). 17 August - Discussion to make future Wikipedia meetup at a diplomatic mission. 18 August - Discussion to make future Wikipedia meetups with newly established local NGO. 26 August - The first Malaysia meetup in conjunction with a conference (Kuala Lumpur 4). 30 August - Discussion to make future Wikipedia meetup with Johor Society for the Performing Arts in Johor. 2 September - Online discussion to make future Wikipedia meetup at Multimedia University in Melaka. 10 September - The third overseas Malaysia meetup (Indonesia-Malaysia Meetup 2) which was with Wikimedia Indonesia Chapter to discuss cooperation between the two sides across the countries. 15 September - The first Malaysia meetup with an archive (Kuala Lumpur 5). 25-26 September - Discussion to make the first meetup in Melaka and with university (Melaka 1). The first Malaysia meetup at library (Kuala Lumpur 6). The first Malaysia meetup in Penang state and at public university (Penang 1). 13 April - Discussion to make Wikipedia Kedah Meetup 1 at Northern University of Malaysia. 14 April - The first Malaysia meetup in the state of Kedah (Kedah 1). We always try our very best to find meetup venues with disability access and on weekends only to accommodate people who are working or studying. Anyone who wish to contribute as the committees of this user group, you may contact Chongkian. Position is just for official purpose. In reality, we all help each other to make things work out :) We are currently looking for people with fluency (speaking, reading, typing) in indigenous languages in Malaysia (e.g. Iban etc). 25 October - The creation of Malaysia article in English Wikipedia. 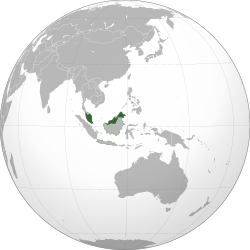 17 February - The creation of Malaysia article in English Wiktionary. 8 August - The creation of Malaysia article in English Wikivoyage. 2 October - The creation of Malaysia article in Chinese Wikipedia. 17 April - The creation of Malaysia article in Tamil Wikipedia. 14 December - The creation of Malaysia category in Wikimedia Commons. 24 October - The creation of Malaysia article in Malay Wikipedia. 5 February - The creation of Malaysia article in English Wikiquote. Please feel free to add your username here if you are interested in the user group and its projects. 20-22 April - Wikimedia Community User Group Malaysia was represented by MYMMMC in Wikimedia Conference 2018 in Berlin, Germany. Report is here []. 5–6 May 2018 - Wikimedia Community User Group Malaysia was represented by MYMMMC and Tofeiku in East, Southeast Asia, and Pacific (ESEAP) regional conference in Bali, Indonesia is here []. This page was last edited on 17 April 2019, at 07:25.